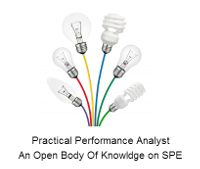 Our mission at Practical Performance Analyst has always been to establish, build a strong Body Of Knowledge around SPE (Systems Performance Engineering). The Systems Performance Engineering or SPE Body Of Knowledge (SPE BoK) intends to cover the following areas - SPE processes, SPE tasks/outcomes and SPE deliverable templates. The SPE BoK is aimed at helping organizations build SPE capability required within their IT organizations internally and also to serve as a reference point for those intending to design/deliver SPE related work. Practical Performance Analyst has always been an open collaborative effort and the intention is to keep it as such. As part of our mission here at Practical Performance Analyst we have several initiatives one of which is called SPE HowTo. As part of SPE HowTo we collaborate with leading professionals with delivery strengths across different parts of the System Delivery Lifecycle to put together relevant SPE HowTos. This HowTo in particular has been in the works for a while and is titled, “Howto Build A Career As A Performance Testing Engineer”. The changing circumstances and the world we live in today recommends adoption of various agile development techniques along with Continuous Integration, DevOps, etc. where the emphasis is not on developing the best or most scalable solution but rather designing a solution that works and getting it out there, iterating as teams move along learning from experiences on the field. The shortening of the development iteration leaves the average Project or Program Manager with not enough time, human resources or money to put together a useful Performance Test. These are some of the realities which the Technical Architects and Performance Engineer of today has to deal with. One of the big challenges of anyone aspiring to become a Performance Testing Engineer will eventually face is getting their customers/organizations to invest in doing the job well and not just doing the job. As a Performance Engineer you have to go in with your eyes wide open not expecting a perfect scenario but rather expecting a broken one where you do what you can with the limited resources on hand to help deliver a system thats engineered to scale and meet the agreed Non Functional Requirements. We are still long way off in our journey of writing all the relevant HowTo’s we have planned to write (See list below). The list only seems to increase in size based on recommendations and input…:). So far we have published four HowTo’s and have a few other collaborative projects in the works which will deliver on some of the others. Professionals interested in collaborating on the HowTo’s below should reach out to us on the email address provided below. We welcome your suggestions on potential opportunities for collaboration. Hope you enjoy the published content here at Practical Performance Analyst. This is work in progress folks and it’s going to take a while to complete the entire list. Am planning on enjoying the journey which is what matters, not waiting for the end as such…. :).Please take the time to send through input, feedback and comments on trevor at practical performance analyst dot com.